Sambousek is a delicious savoury pastry served across the Middle East. Filled with meat, cheese or vegetables, it was also popular in various Jewish communities on the Mediterranean. We're going with a cheese filling, baked and not fried, and we're making 2 versions. One is a Libyan recipe from Food is Love grandmother Rina Mevorach, who makes hers with a yeast pastry and a moderately salty filling; the other is from Colette Rossant, a French American chef, food writer and restaurateur who learned to make sambousek from her Egyptian grandmother. Hers has a flaky buttery pastry, and a very salty filling. Rina is so quick it’s hard to get a photo of her hands at all, they’re always a blur, but another thing I liked on that morning of rolling, stuffing, shaking and baking is the chatter and laughter and those moments of wisdom that sneak through between dishes. When I asked if I could move a plate to another room for a photo, Rina's reply made my day. One of the liberations of old age, or older women, even as they continue their work at breakneck speed. This is one of the dishes Rina is known for, even though she's never eaten a single sambousek herself. This will make double the quantity you need. Rina uses half the dough for the cheese sambousek and the rest for plain savoury dough rings. 1. For the pastry: Mix first 4 ingredients in a bowl. When it’s fermented, usually about 8-10 minutes, add the flour and other ingredients. Stir in the bowl, then knead till smooth. 2. Put back in the bowl, cover with a towel and leave to rise for 2 hours, or till it’s doubled in size. “I do this first thin in the morning on a cooking day,” says Grandma Rina. 3. Roll out the dough as thin as you can – at most ¼ inch / 6 mm thick; thinner if you can. Cut out large circles 100 mm/ 4 inches wide. Place a heaping spoon of filling in the centre of each round, and fold over into a half moon. 4. Use your fingers to make a pattern around the edge, if you are folding it in your hands, like Rina does. Otherwise, press the edges with a fork to seal. 5. As you finish, brush each pastry with egg, and place egg side down into a plate of sesame seeds. Then place on a tray which you have oiled or lined with baking paper. Bake in 180 degree oven for 35 minutes. And by the way, as if she hadn't made enough, Rina used up the rest of the dough for another snack - just dough, no cheese. Colette Rossant has made her career as a food writer and restaurateur in the US, but she spent World War Two living in Cairo with her grandparents. Her parents took her there from Paris as a small girl, after father fell gravely ill. They were from a wealthy Egyptian family, but the French nanny who accompanied Colette took one look at Cairo, turned around and boarded the first boat back to France. She was also lucky, since they were not in France during the War. The Middle East was safer for Jews than Europe. Her older brother stayed behind, so he could keep going to school. They only met again years later, and she found he was terribly affected by the War. l know this because I've read her book, ‘a memoir with recipes’, with the beautiful title Apricots on the Nile, This recipe for sambousek comes from there. In addition to vivid descriptions of local food and produce, Apricots on the Nile evokes the vanished world of 1930’s Cairo and the Jewish community of pre-Nasser Egypt. It’s seen from a chlid’s view point – and very much also from the kitchen. I loved her account of her grandmother’s weekly visit to the food markets in the Cairo Bazaar, with stall holders putting out a chair when they saw this valued customer in the distance. Various watermelons, eggplants or chickens were evaluated, and dismissed or carried home by the servant who accompanied Colettes grandmother - after appropriate haggling of course. It was so leisurely, and yet structured – and so different to shopping today. It made me nostalgic for this Cairo I've never known! I’m including Colette's Sambousek recipe because it's different to Rina's and is an easy tasty non-fried version. I also love the story Colette writes with it. Wherever she is in the world, she says, baking sambousek transports her back to her grandmother's Cairo kitchen, where "I am helping Grandmama Marguerite mix the dough while she sings songs to me in Arabic." 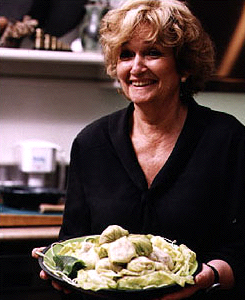 Her grandmama’s family pride was “profoundly linked to the kitchen," so when Colette once attempted to prepare sambouseks for her friends and did not follow the recipe, grandmama was outraged. “The recipe is at least hundreds of years old, you do not change it!” shouted Grandmama Marguerite. This made me laugh out loud. It's gorgeous - the recipe is sacred! -and so different to our philosophy on this project. We take recipes from our grandmothers and re-invent them - - often with their help, as they find their children and grandchildren turning vegetarian, vegan or gluten or dairy free and they still want to be able to cook for them. The original recipe's a building block, something you have to know, in order to be able to adapt it. But adapt you can! With that in mind, I have amended the original recipe slightly. Mix wet ingredients. Stir in 2 cups flour. Turn out onto a floured board and work in another ½ cup flour. Knead until the dough holds together. It will be soft. Shape into a ball, wrap in plastic and refrigerate for 30 minutes – at least. You can do this in the morning, and bake in the evening. 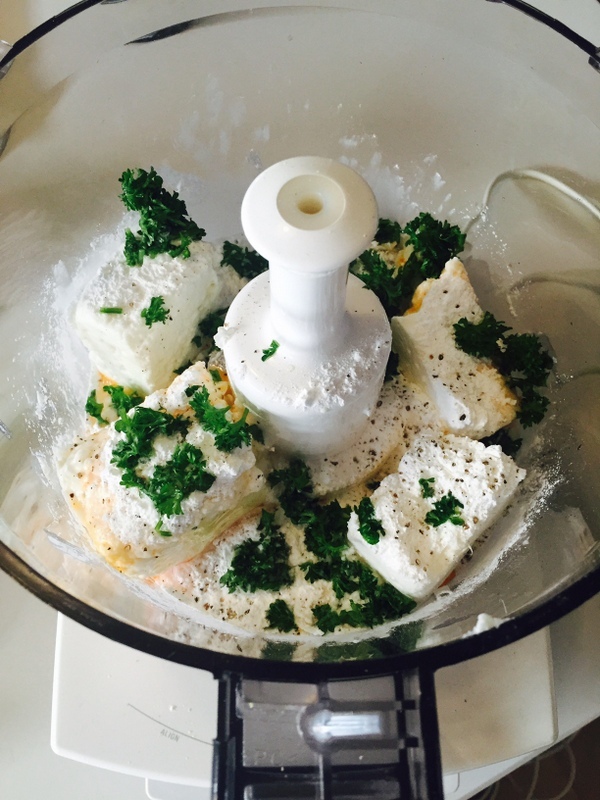 Mix all the ingredients for the filling in the bowl of a food processor till light and creamy. Refrigerate till you are ready to bake. 1. Colette makes 20 balls and flattens them. I rolled the dough out with a pin, hoping it would be quicker. Roll it as thin as you can – at most ¼ inch / 6 mm thick. 2. Cut out large circles 100 mm/ 4 inches wide. Place a heaping spoon of filling in the centre of each round, and fold over into a half moon. Press the edges with a fork to seal. If necessary, wet edges with water to make them stick. 2.. Roll up the dough in between and use it for more sambouseks. As you finish, place each sambousek on a tray that's oiled or lined with baking paper. Brush with beaten egg, sprinkle with sesame seeds and bake at 180 degrees for 35 minutes. I have made these twice now, with olive oil in the pastry, and also a little more salt than the original recipe required. I also found the cheese filling didn't need as much baking powder as in the original. All those adjustments have been made in the recipe above. The filling was too salty when I tasted it. I originally toned it down by adding cottage cheese, but that made it too runny. It slipped out of the sambousek, so very little filling remained. Since the original pastry is not salty, the result the first time was bland. So either you make it as Colette’s grandmother insists has been done in their family for generations – she could be right, as usual, after all! Or if you want it less salty you have to make a more stable filling. Grandma Rina solution of adding a boiled mashed potato is good. I am still working on this! The sambousek is very tasty straight from the oven, less so the next day, so don’t resist the temptation to have seconds and thirds. Eat up quick! In Melbourne, Amanda made Colete’s pastry, but of course gluten free for her home. Amanda used olive oil instead of vegetable oil. The GF flour mix made the pastry delicate to work with once rolled and cut. Amanda used a cookie cutter to make the circles, and had to be very careful when moving each pastry across to the baking tray. “Some I ended up placing one cut-out circle on top of another so that I sandwiched the filling in instead of folding it over – much easier for the dough’s consistency." Still her verdict was positive. All the gluten free kitchens came to the party on this one! Miyuki made it in Sydney with a gf flour very similar to Amanda's. She changed Colette's pastry recipe by adding an egg, and omitting the water. Miyuki also added pine nuts to the filling, which would help hold it together! Miuki says she found this pastry much easier than the gluten free challah! She found the dough was easy to handle AND she simply made a ball the day before, and kept it in the fridge. "For the dough I just rolled out and used it as it is, rather than making a circle as I didn't want to handle GF dough too much - it is not stretchy as non-GF dough." Miyuki mixed the filling by hand with a wooden spoon and these quantities yielded 16 pastries She was pleased with her efforts. "The taste was just delicious and the dough had right texture, soft and crumbly." Miyuki's husband went further. He says liked them so much, he ate a whole tray. "It was tangy/savoury cheesy yet light, original, kinda half Indonesian, half sophisticated goat’s cheesy. One is definitely not enough but substantial and it was healthy, the filling, but meatpie-y too. It was Moorish" - and moreish too, obviously! Miyuki says she will make them again, trying ricotta instead of cottage cheese, and seeing if she can reduce the butter in the pastry and replace it with oil or water.